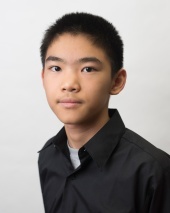 14-year-old IM Jeffery Xiong of Coppell, Texas, has shown tenacity well beyond his years. His resume already is impressive: the 2010 Under-10 North America Continental Champion, a silver medalist in the 2010 Under-10 World Youth Chess Championships, and the 2013 MVP of the entire United States Chess League for his undefeated play for the Dallas Destiny. But it is his creativity on the board and his maturity in defeat that has caught the eye of some of the most renowned chess grandmasters. From a very young age, Jeffery has seen his losses, though painful, as an opportunity to improve. While some of Jeffery’s older competitors have been known to display their frustration with difficult losses, Jeffery remains collected, analyzing where his play could have been stronger. This maturity has helped enlist legendary Grandmaster Garry Kasparov as a mentor in the Young Stars program, and it has led to numerous impressive victories and awards since. Home-schooled now, Jeffery already has been awarded a four-year scholarship to the University of Texas at Dallas, with the chance to compete for their prestigious chess team. The school’s faith in Jeffery is well-founded, particularly since his play in this past spring’s UT Dallas vs. U.S.A. Junior All-Stars event helped his team, the Junior All-Stars, achieve victory over that same UT Dallas university program he may one day attend. Jeffery heads into this year’s Junior Closed Championship riding a wave of recent success: winner of this May’s Chicago Open, Jeffery seized victory over many of the nation’s top grandmasters, achieving his third GM norm.